Latest “Das Schwarze Brett” is now Available! You are here: Home | Cultural Events | Latest "Das Schwarze Brett" is now Available! Das Schwarze Brett shares German, Swiss and Austrian news in Vancouver, BC, Canada. Each issues highlights past and future events, people, news, classifieds and important contact information. 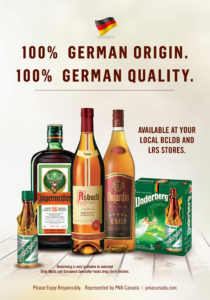 If you are connected to the German Community, or work with the German community, you won’t want to miss this next issue. The table of contents includes a feature story about the History of Underberg (yummy herbal digestive), a story of Robert Holler and the “Nations Warriors Wellness Society”, BC Travel News, German Canadian Business Association, Prospera Credit Union, new Deutscher Platz information, Swiss National Day Celebration, a quiz on how German, Swiss or Austrian you are, Vanishing German businesses, passive house schools, Klaus Priebe, the Consul General of the Grand Duchy of Luxembourg, Vancouver Alpen Club and their Oktoberfest plans, GermanFest 2005, the European Festival, the Alpen Plattlers, PACO ERHARD who brings the “5-Steps to Being German” to the Fringe Festival, info about all the German Schools in the Lower Mainland, Swiss Quality Coffee Systems, breaking news regarding a new German Cultural Centre in Vancouver, Classifieds, Oktoberfest Events and important contact information – including links to CETA related items. You just need to go to www.magcloud.com and sign up. 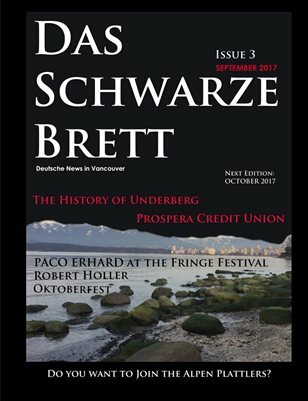 Then you can read Das Schwarze Brett online for free, or order a print copy at home. I look forward to hearing from my readers – whether you are interested in advertising in the October issue, interested in contributing a story or interested in being an “order hub” at your place of business.